Rufus knew he needed more education if he wanted a higher paying job. So he went to the Dane County Job Center where he enrolled in the Workforce Innovation and Opportunity Act (WIOA) Adult Program through the WorkSmart Network to access career and training options available to him. While working with his WIOA Career Services Specialist, Rufus learned of a new short-term training offered in partnership with Madison College. The 14-week Welding and Fabrication Academy was designed to help individuals like Rufus skill up quickly to advance in their industry with career readiness and technical skills. For Rufus, it meant stepping onto a college campus for the first time. 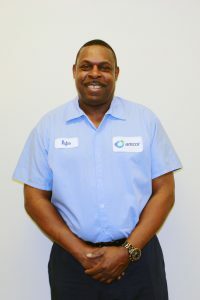 Amcor hired Rufus as a Flexo Press Operator to run the press machines that print flexible medical packaging like band-aids and gauze packaging. The permanent position is full-time and offers a great benefit package for Rufus to help support his family. And Rufus recently completed his 90-days of on-the-job training, which offers workers more experience and businesses an affordable way to train new employees. Rufus believes he got this job thanks to the Academy. He hopes his success story can encourage others to attend Academies and get an education. And he especially wants to encourage his children to get an education. “Go to school. Go early. Don’t go late like me,” he tells them.